Offset bent longitudinal reinforcement is the bending of vertical reinforcement bars of a column (larger column) at a particular storey in order to bring the bars within the limit of a column above (smaller column), as illustrated in Fig. 1, A. The maximum slope of the bent bars should be 1 in 6. Added to that, it is required to provide extra ties for the area close to the bent bars to counter the forces generated due to bar bending. 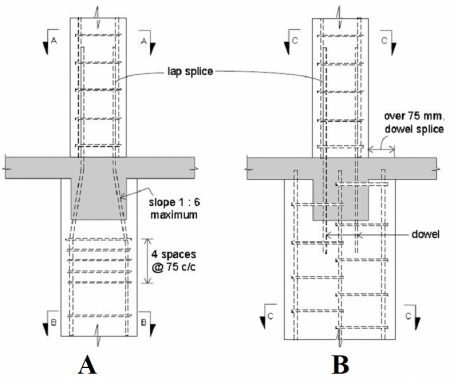 If the face of the column above is offset at 75mm or more from the face of the column below, then offset bent is not considered but rather splicing of column bars by separate dowels is used, Fig. 1, B. The maximum slope of the inclined portion of an offset bent bar with the axis of column shall not exceed 1 in 6, ACI 318-14. Portions of the bar above and below an offset bent shall be parallel to the axis of the column, ACI 318-14. Additional lateral ties, spirals or part of the floor construction are examples of horizontal support which are placed close to the point of bend to counter the transverse force generated due to the change of direction at the bend. Horizontal support provided shall be designed to resist 1.5 times the horizontal component of the computed force in the inclined portion of the offset bars. Lateral ties or spirals, if used, shall be placed not more than 150 mm away from the points of a bend. When the offset between column faces exceeds 75 mm, the vertical bars in the column below shall be terminated at the floor slab, and splicing of column bars by dowels may be necessary. Dowels may also be necessary when the placing of part of the structure is delayed, and also between various units of structures (such as footings and columns). Dowels bar size and grade need to have the same size and grade as the bars joined, and should be of sufficient length to splice with the main bars. Similar to bent offset, when column bars are spliced, additional ties shall be provided at and near the ends of spliced bars, to provide confinement to the highly stressed concrete in the regions of the bar ends.